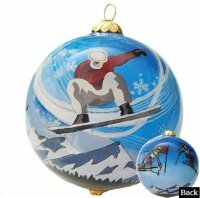 This 3" round ornament is hand painted on the inside! No two are exactly the same. The painting process for each item takes three days to complete. Each ornament comes in a silk covered gift box padded to cushion the ornament inside. The color of the box is coordinated to the design.